I bought a wonderful little Bible to read to Addie Lee. It's called "God's Little Princess Bible". If you have young girls it is wonderful. It is a little advanced for my three year old but she listens well. With every story it has some "princess" thing to do or a little story about God's little princess and how the story can be applied to real life. The other night we read a story about spreading the good news (Matthew 28). It also talked about using your feet to follow Jesus and spread the good news. The life application was to put your feet in a warm bubble bath, rub some lotion, and paint your nails. While you were pampering your feet you were to think about how you could follow Jesus and help spread the good news. So, today I decided to do that with Addie Lee and remind her of the story. ME: Do you remember what Jesus wants us to do with our feet? AL: Yes, He wants us to wear slippers. ME: No, remember when we read the Bible story the other night we talked about using our feet. AL: Oh yeah, he wants us to wear socks. I did go on to explain what the story told us to do but that was after I had a good laugh! 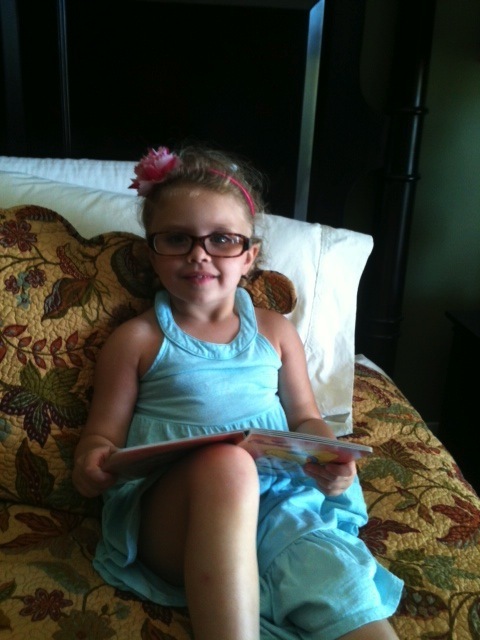 She was sitting in my bed with my glasses on, "reading" her Cinderella book. She also loves to put on the same color dress as me, talk to her dolls like I speak to her, etc. Kids are such sponges. They want to be just like us. Therefore, it is our duty to set the example. We should not ignore them to play on our phone or the internet, we should not watch unlimited amounts of television while they are "playing" by themselves, we should not allow them to hear ugly or inappropriate things come from our mouth. We must guard our mouth and our actions and they want to be just like us. It warmed my heart that she had this on. It's a way for her to show how much she loves me without speaking the words. I am blessed to have two wonderful children. It is our (Dustin and my) responsibility to train them up in the ways of the Lord. On Sunday we heard from Deuteronomy 6 which gives this commandment in verse 5: "You shall love the Lord your God with all your heart, with all your soul, and with all your strength." It continues in verse 7: "You shall teach them (the words commanded) diligently to your children, and shall talk of them when you sit in your house, when you walk by the way, when you lie down, and when you rise up." Wow, what a large commandment we have been given as parents. I know I fail at this every day but I am trying and am improving. It is my prayer that I would help my children hear, say, do and go where God wants us to go. So, as parents, we need to be careful what we say and the actions we take because we are training these little precious children to do just as we do. This is not a post directed at anyone but myself but I thought it might encourage others. by the farming bug! Kimber that is! Planting season started about 2 weeks ago and we have been on the farm almost every day. Kimber LOVES it! Here he is waiting on the planter to get to our end of the field so he can hop on and "help". Isn't he cute? Here he is riding in "his" seat. One day, he was getting too much for Dustin to handle driving and he put him in the "buddy seat" and that's where he's wanted to be since. He even told me that was his seat and I could not sit there! I had to sit behind him on a console type thing (and yes, that is the way I describe most things farm related; I'm not great at the names of things but I'm trying to get better). This scene melts my heart every time. I just love it. When Kimber sees his daddy getting off that tractor he runs toward him. So sweet. That boy loves his daddy; and, of course, he is his daddy's world. Here he is riding in "his seat". At this point, I'm on the floor of the tractor. If you've never been on a tractor it's not really made for 3! Here are the "farmers" looking for the seed they just planted. This is Kimber showing me the seed he found in the ground. Of course, we put it back because every kernel counts! Last week was Addie Lee' spring break. We relaxed the first couple of days then headed to the beach for real relaxation the end of the week. The kids just love the beach! It was a bit chilly but they didn't care! This was the day we got there. They had to get to the beach. It is beautiful. It's awesome to see God's work! It was cool but the condo has a heated pool so we swam everyday. I gave them rings and they just kicked around the pool. It is my mission to teach both of them to swim this summer.